With the recent Melbourne Food and Wine Festival, I took the chance to retry some old favourites (like The Press Club, which I hadn’t been to since before MasterChef and the many other things that arise within such a long period of time). My last visit had been for my birthday and I felt spoilt with a vegetarian platter including skewered saganaki over a shot glass of olives. The Melbourne Food and Wine Festival offered two courses, a glass of wine and tea or coffee for $40 - reasonably good value for a fine dining lunch. Over the phone, they confirmed that vegetarian would be possible. When we arrived for our 12pm sitting, the deal with Express Lunch is that you have to arrive on time and finish within the hour, the restaurant was already abuzz. The vegetarian options were taken from the main menu but minus the meat, an approach that I find slightly unsatisfying where a vegetarian dish is not created in its entirety. 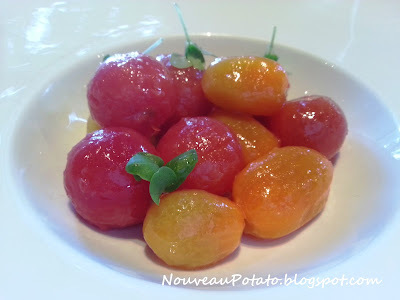 First was a tomato salad of red, orange and yellow tomatoes. They had been skinned and served fresh with olive oil and baby basil. The key to this dish was the produce. The tomatoes were fresh and sweet, almost as good as those my father has been diligently harvesting from his garden lately. When tomatoes are this sweet and juicy, you remember that they are indeed a fruit. 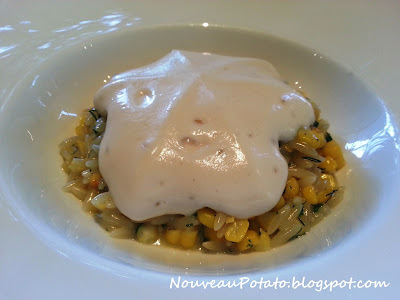 The main was risoni with corn, dill and an interesting cauliflower foam. This dish was actually quite delightful, I should stop discriminating against corn, it is not such a bad vegetable after all. The textures of the foam, pasta and corn were a nice range from a juicy froth to a soft bit. Coffee was Greek style, strong and spicy. Wine was a dry pinot grigio – oh how I miss the wines of France. Whilst the vegetarian entree could have been more creative, the meal overall was satisfying and pleasant. At $40 one cannot complain.